This has a huge change compared to the beta for the mobility version related to a 'crash when closing the lid' issue. PS. There is a small probability that it coincided with a related Windows update but I doubt it. Is 13.4 any good for HP laptops with the dreadful Radeon HD 7690M XT ???? Thnx !! would really apperciate any feedback from people that tested this driver or any other that works for them. After installing this new driver, I've lost the sound in my Smart TV when using the HDMI connecting the PC and TV. There are just images, no sounds. Someone knows what can be? If you are having the same problem that some of us have then, yes, there is a workaround. But if this is the first time you are having a problem with HDMI audio then I think your problem might be different. So, what drivers have you used recently and what files are you playing and what programs have you used to play them? Here's a link to the fix I used. Here's a link to a page with me talking about my issue. I have lots to say, and in several posts. It's another forum but I'm Babel-17 there as well. not sure what AMD have done with these compaired to 13.3 beta 3 or what ever the beta's was called but I am getting lower performance from my my mates 6970 , bioshock infinite was giving me a min fps of 55 fps but with these I get 45 fps and the avp benchmark is 6 fps slower . I noticed the same with my 6870. Less frames in Bioshock Infinite, even compared to the 13.1.
any problem with your current driver? 13.4 is 13.3 beta 3 anyway. the thing is, i have this fu*ked up graphic card, everyone who has it knows what i'm talking about. I tested so many drivers (leshcat's sometimes do the trick), the official ones never worked. I tried this one yesterday, it was stable but horrible FPS. my intel was doing better LOL. I'm running on the 13.5 BETA2 and it's working like a charm, great FPS, etc.. Haven't crashed so far. I might however test 13.4 Leshcat's later if it starts crashing. I owned similar gpu, HD6770M which then rebadged to HD7690M XT. From my experienced, only 2 things can slow down this gpu below HD3000 level. 2. Stucked at 2d clock, 400mhz/800mhz. For the 1st problem, i use ThrottleStop and for 2nd problem i need to replug the power cable, make sure its done with battery plugged in. I use MSI Afterburner to monitor the GPU all the times. I remember using MSI Aferburner & i cudn't really overclock. I just downloaded ThrottleStop but to be honest, i have no idea what to do with it... any advices maybe? Is the gameplay any smoother? There's been reports of games getting lower framerates, but also having lower frame latency too (for smoother gameplay). This driver fixed my monitor brightness setting for win8 64bit. If your temperature is good, tick Multiplier and set it to Turbo, then turn On ThrottleStop. If temperature is bad, set it to your Base multiplier or tick Disable Turbo. For MSI Afterburner, close and reopen it when u start playing game/using that AMD GPU. Here's how to enable the OSD and extra goodies in MSI Afterburner so you can monitor the GPU performance in game. The guide is old but u get the point.. i hope. Download the latest beta in MSI/Guru3D website. Thanks, been holding out since 12.11 so I'm gonna go with these now I reckon it's time for an upgrade. 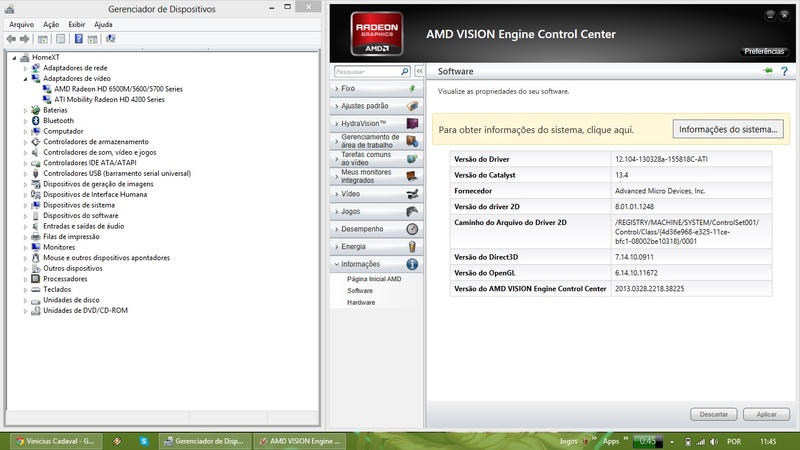 Thanks AMD for the first drive to run ok in my HP notebook, under windows 8. Custom application profiles in CCC were broken (at least for me) in 13.3 Beta 3. I could create them, but the settings weren't applied for real. In Cat 13.4 WHQL they are fixed again. Over 90c is bad, disabling TurboBoost will significantly drop your max temperature. Try this, click Setting at Msi Afterburner main window and then enable Unofficial Overclocking Mode with PowerPlay support. Close Afterburner and run some game. While in game, Alt+Tab back to desktop and reopen Afterburner. I installed 13.4 whql on a clean, fresh Windows installation within Device Manager... I pointed the "Update Drivers" to a folder with extracted 13.4 files, and everything went fine -as it seems. You should be able to run Catalyst Install Manager and express remove everything to be sure. But doing the delete driver software should clear a good bit, if not all of the files created. That's the problem, mate. Besides the clean driver that Windows is handling through Device Manager, I'd like as less AMD code on my PC as possible. Anyway, thank you. As it seems it's working pretty fine and zero issues so far. Heaven benchmark result is slightly less with 13.4 compared with previous driver. And I'm getting framedrops in Crysis 3 :'( When I look around fast, the image freezes for a split second... Very annoying... Didn't have that with the previous drivers. Bioshock Infinite is smoother than with 13.3 beta 3 and Tomb Raider took a big FPS hit with 13.5 beta 2. With Tomb Raider for instance I play at 60FPS at 1080p with everything on Ultra except Tessalation is off and Hair Quality is set to Normal. My friend has an 8 core processor and a Nvidia GTX 680 and the only difference with his single card and my 5850 Xfire is he can play with tessalation on and still get 60FPS. With TressFX his FPS drops to 52 FPS. We both have vsync on. I lost over 10 FPS on the benchmark with 13.5 beta 2. Updated from 13.2 to 13.4 yesterday. Lost all sound via HDMI. This is the first time this has happened. There is actually a small bit of sound, but it trips out and can only hear a fraction of music every so often. After I had basically no sound, I did a full uninstall of drivers, and reinstalled 13.4. Still no sound via HDMI. I did a full uninstall, and installed 13.5 beta's. Same thing. Did a full uninstall and went back to 13.2. No issues. There is something seriously jacked up with 13.4+'s HDMI audio drivers. Every driver this year has screwed up the menus on both Counter-Strike: Global Offensive and Dota 2. I get 10 fps in the CS:GO menu, and the Dota 2 menu gets really laggy when I look at a player profile. My framerate also gets cut in half in-game when I open the scoreboard in Dota 2. It has basically ruined both games for me. I could have sworn that reverting back to 13.1 helped me a month ago or so but even that driver isn't working properly in those games for me now. I'm at a loss. I've reported this on the AMD report site but I'm not sure they even check that any more, as the list on that page only goes up to driver 12.6. I've been a loyal ATI users for a very long time but I'm just gonna get an Nvidia 7xx when they come out in a few months if I can't play my two favorite games. The (12.101.2.1 April 16) driver got rid of the lag for me a month ago or so but when I reinstall it now I'm getting the same crap with all the other drivers. Does anyone here know anyone at AMD so you can tell them about this really old problem with those two super popular games? I'm afraid they're never gonna fix it.